Thought I'd start a thread of memory pics for one day when I'm old like J-dog. Got the bike on the Thursday 28th at 10PM. Then Sunday at 3PM decided to do Elandsrivier road to Patensie and back on the tar. Whos bike is this and what did you do with Thump? Weekend of 6th Nov 2010. Went on bike to a church Men's camp. expecting to ride to Darlington dam afterwards on the Sunday. So I rode out in the rain on Friday night expecting a good ride on Sunday. That is a slippery road in the rain. On Saturday, I noticed me chain was very slack and further inspection showed the sprocket teeth snapped off in places. Later found one of the rollers on the chain had broken off resulting in a very quick deterioration of the sprocket. So just went home instead. So after changing chain and sprockets, I went for a short bush ride to get a feel for the bike. Did not do anything daring as I was on my own, just exploring a bit. Got into one or two scary parts, but was actually easy once I went for it. I've got to learn to be softer on the throttle, this bike "Spin vir niks"
Tomorrow I'll got with J-Man & 214, so will have back up. Mine, and I'm still here. So...how do you like it so far? Lekker, what time tomorrow? Sparrow fart? Just a friendly reminder, if you topple over, I'll hold the camera, I aint pickin up that monster thing! Hey Thump, congratulations .... hope you have many happy KM's on the Katie!! 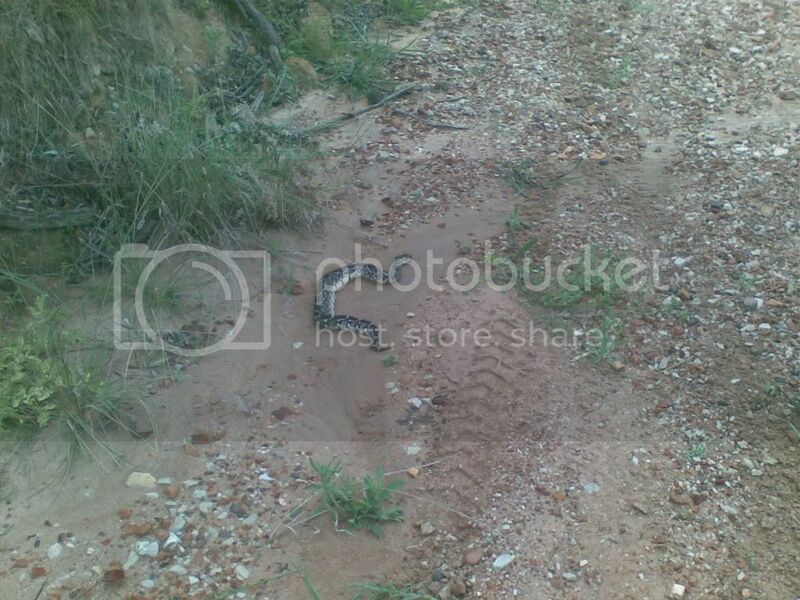 Look how close he came to this snake and did not even see it. Notice how scared that puffy looks? Thanks J-man, 214 and Tyger, I had an awesome time. Starting at±07h20, We did 60km together, then another 104km after J-man left. didn't take too many photo's, having too much fun. Unfortunately even more space is being fenced off. 214, Tyger and I Ended the ride off with a meal at the 3 legged pig, getting home at ±15h00.